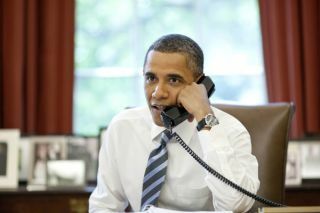 President Barack Obama speaks with the crews of STS135 and the ISS from the Oval Office at the White House. WASHINGTON — Two U.S. senators flatly accused the White House of trying to sabotage the nation's human spaceflight program after a newspaper report based on leaked NASA documents said a congressionally mandated heavy-lift rocket, crew capsule and associated infrastructure could cost nearly $63 billion through 2025. The heavy-lift Space Launch System (SLS) was designed as the foundation of the next U.S. government-owned space exploration system, which would also include a deep-space capsule called the Multi-Purpose Crew Vehicle (MPCV). Both were ordered up in the NASA Authorization Act of 2010, signed last October by U.S. President Barack Obama, who has since been accused by lawmakers of stalling on SLS. Nelson and Hutchison said the upper range of the cost estimates are "based on an imaginary 'acceleration' of SLS development." They said a $57 billion cost figure pegged to one of several scenarios laid out in the document — a copy of which was obtained by Space News — is nearly double an estimate provided by Booz Allen Hamilton, a consulting firm that conducted an independent analysis of the SLS, the MPCV and associated ground support infrastructure. The NASA document lays out five cost scenarios for SLS, the MPCV and supporting ground infrastructure. Each cost estimate runs from 2012 to 2025, and each assumes a different funding scenario. Besides development costs, personnel costs at NASA centers were included. The most conservative funding scenario is based on the administration's 2012 budget request and assumes a no-growth NASA budget for the next five years. SLS and associated programs would cost about $41.6 billion under this scenario, with the first crewed flight of the MPCV, also known as Orion, taking place in 2021 on an SLS variant capable of launching 70 metric tons into Earth orbit. This version of SLS would fly once every two years, after that. Also under this scenario, an SLS variant capable of launching 130 metric tons would not be ready until the 2030s, the document says. The high-end estimate assumes a funding scenario where SLS development is accelerated so that the rocket and its crew capsule can achieve a greater flight rate. In this scenario, costs through 2025 would be about $62.3 billion, and the 70 metric-ton SLS variant would fly crewed missions once a year beginning in 2018. Also included in this scenario is $4.5 billion for "in space elements," which could include things like Earth-departure stages, landing craft and in-space propellant storage. A 130 metric-ton version of SLS would be ready in 2021, under this scenario. Sen. Richard Shelby (R-Ala.), another SLS backer, called the leak of the cost estimates "typical of an administration that has been determined to kill this program all along. When the Booz Allen Hamilton study didn't reach the conclusion that the Obama Administration had hoped for, it started leaking figures from some new 'internal study' in an attempt to justify its dithering and flagrant defiance of the law," Shelby said in a statement emailed to Space News. Shelby is the ranking member of the Senate subcommittee that makes appropriations for NASA. He is a fierce advocate for the Marshall Space Flight Center in Huntsville, Ala., which will host the SLS program office. The leak of the SLS numbers brought out the program's critics as well. Rep. Dana Rohrabacher (R-Calif.), who has advocated redirecting funds from SLS to NASA's effort to nurture commercially developed systems for ferrying crews to and from the international space station, said the cost estimates are grounds for terminating the heavy-lifter program. "If true, these estimates are ridiculous," Rohrabacher said in response to a Space News query. "There is no way that the American people want us to spend more than $60 billion for a space exploration program that includes only one manned spaceflight before the end of the decade. Congress just canceled Constellation last year for these very same reasons." Constellation refers to the hardware designed under the previous administration's plan to return astronauts to the Moon by around 2020. Obama canceled Constellation in favor of commercializing space station crew transport while developing technology for deep-space exploration, but many of the Moon-bound program's main elements were restored in the NASA Authorization Act. The head of one commercial space company said it is unclear how NASA arrived at the cost estimates contained in the leaked document. "The way NASA does accounting, you can make the numbers come out to be anything you want it to be," said Jeff Greason, chief executive of XCOR Aerospace of Mojave, Calif., which is developing vehicles to carry paying passengers to suborbital space. "It's a deliberately opaque process." "The essential feature of Constellation was that it couldn't be done within NASA's budget, and I do not see anything in the proposed SLS-MPCV architecture that changes that," Greason said. The SLS, whose requirements were specified in detail in the NASA Authorization Act, is similar in design to the Ares 5 cargo lifter that died when Constellation was canceled. The MPCV, meanwhile, is virtually identical to Constellation's Orion capsule. At least one contractor slated for a major role in SLS, rocket-engine maker Pratt & Whitney Rocketdyne of Canoga Park, Calif., also was critical of the leak. "Sound decisions aren't made on sketchy financials leaked to The Wall Street Journal," Jim Maser, president of Pratt & Whitney Rocketdyne, told Space News in a Sept. 8 telephone interview. "Our opinion of this is that it's highly sensational and not validated."